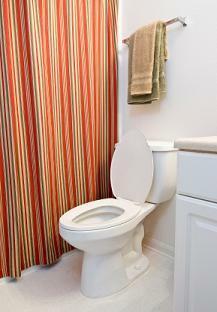 Installing a new toilet is a pretty simple and quick project once you know the basics. Now that you have all the proper tools for installing your brand new toilet, you're ready to begin. Take the tank out of the box - Place it gently on the bathroom floor on top of a towel to protect both the floor and the tank. Inspect the tank for any cracks or chips in the porcelain and make sure that all the pieces are there like the fill valve and necessary nuts, bolts and washers. Lift the toilet bowl out of its box - Bowls and tanks are sold separately, so you need to inspect both. Again, look for cracks and chips in the porcelain. Be sure to also turn the bowl upside down to inspect the underside. Now that you've inspected the toilet and the tank and found no major defects, you can begin the installation process. Clean the flange - If you aren't installing a new flange, be sure to clean off all the wax from the old wax ring. If you don't, the new wax ring may not form a tight seal and then you'll have a leak on your hands. Make sure the toilet area is free from debris - If there is something on the floor, it will cause the toilet to rock and break the wax ring seal. Insert the flange bolts into the flange - Be sure to also use the plastic washer to ensure the bolts stay in place. Mark the placement of the bolts on the floor - Do this by placing a long ruler, screwdriver or stick (like a dowel) horizontally on the floor. This makes it easier to get an idea of where the flange bolts are when you go to put the toilet in place. Turn the toilet bowl upside down and put on the wax ring - Gently twist the wax ring on the bottom of the bowl to make sure it stays in place while you're lifting the toilet for installation. Lift the toilet bowl up without letting the bottom touch the floor - If the bottom touches the floor the wax ring will shift and you'll have to start over. Gently place the toilet on the flange - You have to be sure to line up the bolts on the floor with the bolt holes at the foot of the toilet. Get someone to spot you for this so you don't end up breaking the toilet bowl. Gently press down on the toilet bowl - You can press down with your hands or simply sit on the toilet. This makes the wax ring seal to the flange and strengthens the seal at the bottom of the toilet bowl. Lift the tank onto the back of the toilet bowl - Be sure to line up the rubber gasket on the back of the tank with the hole on the back of the toilet bowl. Insert the screws - These screws come with your toilet tank and are inserted from the inside of the tank to the outside. Secure the screws with the provided washers and nuts. Check to make sure the tank is level - Place the level on the top of the tank while tightening the bolts to periodically check to make sure it is level. Connect the water supply at the bottom of the toilet. As you can see, installing a toilet isn't as difficult as it may sound. A few simple preparations and maybe a hand from a helpful family member and you'll have your new toilet up and running in no time at all.